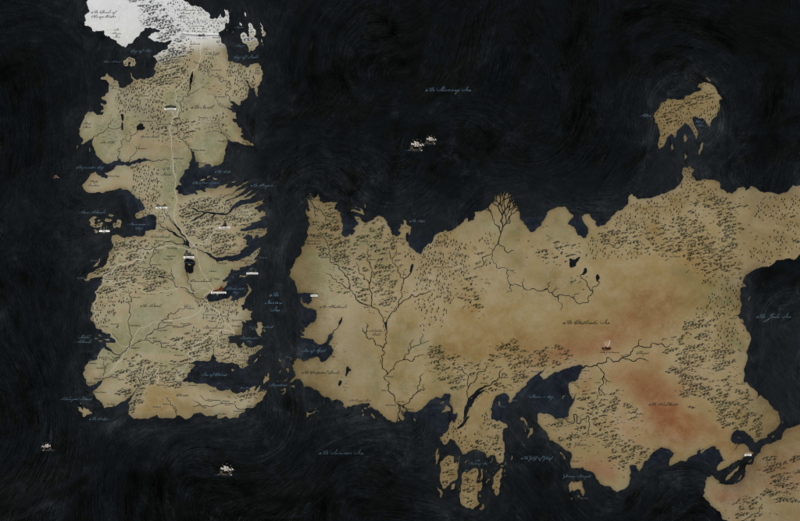 The northenmost area of Westeros, populated by free folk. A massive wall stretching 300 miles separating the Seven Kingdoms from the wildlands. The main fortress for the Night's Watch. The seat of House Stark. Used for dining and greeting guests. A greenhouse heated by the hot springs. Used to grow fruits, vegetables, and flowers. A collection of many books; a stone staircase winds about its exterior. Where the sleeping chambers for the Stark family are. A gate located close to the kennels and kitchens that opens directly into wolfswood. The seat of House Bolton. Dim and smoky; with rows of torches grasped by skeletal hands jutting from the walls. Contains a special room where the flayed skins of enemies are hung. The seat of House Mormont; sworn to House Stark. A wood-walled castle with a smoky keep, housing the Mormonts. Built of huge logs and surrounded by an earthen palisade. The seat of House Cerwyn; half a day's ride from Winterfell; sworn to House Bolton. A harbor city and trading port for the North. Large forest in the North with weirwoods, wolves, boars, and hunters. On the border of the Riverlands; a swamp/marsh with carnivorous reptiles the size of lions. The seat of House Reed in The Neck; sworn to House Stark. A large bay with the Neck running along the western edge. Stormy, rocky islands ruled from the island of Pyke. The seat of House Greyjoy. The seat of House Tully. Where large councils are held and the high seat of the Tullys sits. The living chambers, triangular, and contain's the lord's solar. A seven-sided sandstone building with images of the Seven Holies on marble. A bright and airy garden with redwoods, flowers, nesting birds, and streams. The heart tree is a slender carved weirwood. The seat of House Frey. The largest castle in the Seven Kingdoms; now a dark and ruinous place. Seat of house Baelish. The seat of House Mallister. An inn that lies between the crossroads of kingsroad, river road, and the high road. The seat of House Arryn. The capital of the Seven Kingdoms; site of the Iron Throne. The seat of House Targaryen. A fortress within the castle containing the royal apartments. A large forest; rainy with fertile hunting grounds. A large body of water along the Crownlands. The seat of the House Clegane; holds fealty to House Lannister. The seat of House Lannister. A place for dining and greeting guests. A garden; contains a small weirwood. Where the sleeping chambers for the Lannister family are. A walled city ruled by House Lannister; one of the major ports. The seat of House Tyrell. The seat of House Florent; sworn to House Tyrell. The oldest city in Westeros, home to the maesters' Citadel. The seat of House Dayne; sworn to House Martell. The greatest and most powerful of the Free Cities. A large area of woodland and forest. The only city of the Dothraki people. A holy mountain within sight of Vaes Dothrak. Only men are allowed to step foot on it. A large holy lake surrounded by reed and reported to have no bottom. Pastures and hills inhabited by the Lhazareen, sheep herders, often raided by Dothraki khalasars.